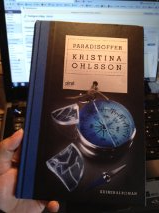 Victims of Paradise is Swedish crime author Kristina Ohlsson’s fourth book about Fredrika Bergman. In the first book Fredrika Bergman begins as a civilian employee of the police where she works in a special investigation team headed by Alex Recht. In this book Fredrika has left the police and started a new job at the Justice Department. Alex has also started a new job at the National Crime Department. A plane is hijacked on their way from Stockholm to New York. The various authorities in both Sweden and USA are doing everything they can to find out who is behind the hijacking and bring down the aircraft safely. Both Fredrika and Alex becomes involved in the case through their respective authorities. We also get acquainted with the very colorful character Eden, leading Swedish Security Service. Terrorism is a “grateful” but horrible theme in today’s society as the last 10 years been characterized by terrorist threats. In this, moment for example, The Norwegian terrorist Breivik who killed over 70 people in Norway is on trial. He is apparently convinced that Islamic culture will take over the world. Kristina Ohlson – Two successful careers. With this theme Kristina Ohlsson uses her know ledges of her second career. Apart from being a successful crime author, Kristina Ohlsson is currently working as Counter Terrorism Officer at the OSCE (Organization for Security and Cooperation in Europe), the world’s largest regional security organization and is on leave from a job as an analyst at the National Police. Her knowledge gives great credibility to how the different departments handle the situation in the book and I can not help but be a little jealous of Christina, who has two very exciting career! I thought Kristina Ohlsson experimented a bit too much in her last book, and she continues with the experimentation in this book but in a new direction. The book is takes place over two days. It is in a way very clever, the book follows the deadline of the story and builds up tension in a great way. We as readers get a good sense of how stressful it is in a situation like this. In addition, we frustratingly follow the bickering between the different authorities, when all they really should do is cooperate with each other and keep politics out of it. On the other hand, it gives the format a limited space for the relationships between the characters, even if the twist with Alex’s son is nice. I would have liked if she had developed the character Eden more. Added some more flashbacks and thoughts, and built up secrets for the next book. A good Crime author with even greater potential! Kristina Ohlsson is a great crime writers with high suspense factor, great characters and a language with drive. In this book it was thrilling, but at the expense of the depth of the characters and I can not help compare with Deon Meyer’s 13 hours that takes place in even less time with time pressure and still had depth and great suspense. A big plus, however, to Christina for daring to experiment. Who knows what amazing books she will write in the future if she continues like this!